Google Video added a new option to the advanced search page: you can now filter videos that weren't uploaded to video sharing sites. 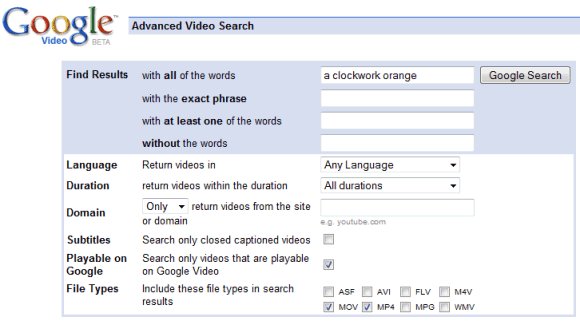 If the search results include many videos that have one of these formats: ASF, AVI, FLV, M4V, MPV, MP4, MPG or WMV, you can exclude them by unchecking the corresponding box. Unfortunately, Google Video doesn't provide an option to restrict the results to one or more of these formats, like you can do at Yahoo Video Search.